NEW YORK CITY, NY – The 3rd iteration of the Hudson River Derby kicks off this Saturday at 1:30pm. 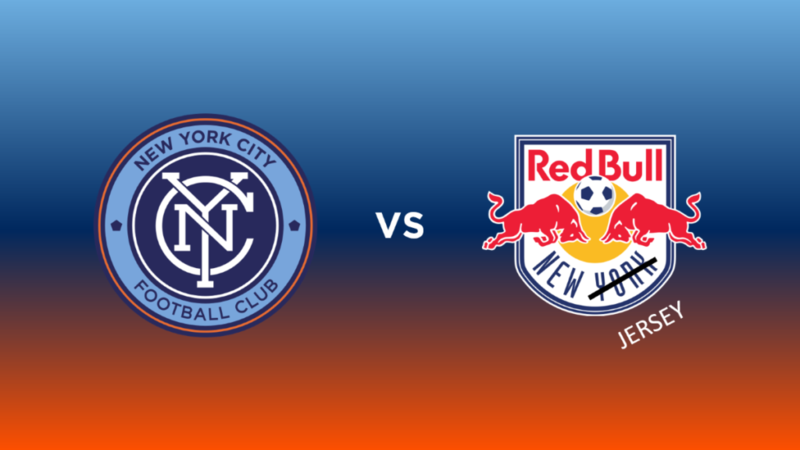 The first of three matches on the docket for this season, New York City FC will look to improve their 1-6-0 record against a Red Bulls squad that has struggled to find its feet. “New York” Red Bulls come into this match 7-7-2 with 23 points, good for 5th position in the Eastern Conference. They are 5-1-2 with a +5 goal differential when playing at home (11 scored, 6 conceded). New York City FC is 8-5-3, sitting on 27 points and in third place in the East. Away from home, City own a 3-4-1 record, with a +1 goal differential (12 scored and 11 conceded). The all-time record for these teams has Red Bulls firmly in the lead, with six wins in seven opportunities in all competitions. Red Bulls have also outscored City 18-5. Red Bulls come into this match off a 2-0 victory at Philadelphia, but their form has been inconsistent lately, going 2-2-1 in their last five matches. The outcome may have been different, if not for a 53rd minute red card shown to midfielder Derrick Jones. The man advantage nearly proved fruitless for the red team, who were unable to get on the board until an 87th minute strike from front-man Bradley Wright-Phillips. Wright-Phillips – the reigning Golden Boot winner – notched another in stoppage time to secure the points for the away side. Of note in that last match: Red Bulls midfielder Felipe drew the foul that led to Jones being sent off. According to MLSSoccer.com’s Matt Doyle, that is the fifth such foul the Brazilian has drawn this season. Felipe is one yellow away from an accumulation suspension. Marsch had to catch a flight to Poland, where he was continuing his UEFA Pro License course. That left Red Bulls training in the capable hands of assistant Chris Armas. Armas’ name should of course be familiar to City fans, as it was under his tutelage that the rival club ousted the Boys in Blue from the US Open Cup just two weeks ago while Marsch was serving a suspension. He will return to the touchline in time for Saturday’s match. Tactically, Red Bulls haven’t changed at all; the club still plays aggressive, pressing soccer for all 90 minutes. What has changed is the personnel. Newcomers include left-back Aaron Long and midfielder Tyler Adams. NYCFC got a taste of the new-look squad in the US Open Cup, but some would argue that this match is a different animal – that the league matches matter more. NYCFC is in good form lately, taking points from four of their last five league matches with three wins, a draw, and a loss in that span. Since losing midfielder Maxi Moralez the last time they played Red Bulls, coach Patrick Vieira has had to make some decisions about who replaces him at the #10 slot. Last week, in a 2-1 victory over Seattle, Jack Harrison filled that role with mixed success. Pitch conditions and lack of opportunity stymied his production from the center, but once moved back to his normal slot on the right wing he was more effective. It’s likely that Harrison will again get the call in the center of the pitch, though Vieira said in a media event Tuesday that he hadn’t ruled out a two-striker formation to get David Villa some help at the front. In a 4-4-2, Harrison and Rodney Wallace could potentially book-end a midfield with Yangel Herrera and Alex Ring packed toward the center, with Ugo Okoli or possibly Tommy McNamara helping Villa at the top. Fortunately, City will also have a healthy Ronald Matarrita to bolster a defense that has seen some regression lately. Ben Sweat filled in nicely on the defensive side of the ball, but there’s no replacing a player like Matarrita, who is tireless both in attack and defense. “Of course it will be a hard one but it will be a hard one for them as well. It will be very important for us to stick to our gameplan, to respect what we’ve been working at throughout the week but in these types of games, it’s important for us to roll our sleeves up and to compete – to fight. The return of both Matarrita and Herrera makes for a very different-looking NYCFC midfield than the one that took the field two weeks ago. It will be much more difficult for Red Bulls to muscle players off the ball and steal possession in advantageous positions from the likes of Ring and Herrera. Combined with Matarrita and Wallace pushing up the left side, with Harrison’s technical ability opposite, this match already looks very different than anything we’ve seen in the Hudson River Derby before.